Being engaged is a whole lot of fun. There’s the endless stream of congratulatory texts, Facebook messages and the periodic (and far more personal) congratulations cards. You may plan an engagement party and follow it up with a few more congratulatory brunches. But the real planning has not yet begun. Planning a wedding on the other hand, may be a little more than some bargained for (literally). While some aspects of getting started to plan your big day may be overwhelming, when it comes to how to collect mailing addresses for wedding invites, Postable can help make. We hope you’re taking the time to bask in all of your well-deserved-engaged-glory. And while you’re enjoying the endless flow of champagne and the sparkle of your shiny new ring, have you started thinking plans yet? You may’ve begun drafting your wedding guest list which will give you an idea of all the mailing addresses you’ll be needing. Ok, maybe you’re not thinking about that yet… but you will be… Much sooner than you think (cue scary music). Fortunately we here at Postable have created a solution to the extremely specific problem of getting a bunch of people’s mailing addresses for a wedding (cue happy music). So you’ll be able to send your Save the Dates, Invitations and Thank You Cards stress-free. In fact we can even mail them for you if you want but that’s another blog post. Okay. How easy is it really? (4) They click the link, fill out a quick form & their info magically appears in your address book! So easy! Pretty Great, right? Sign up for your free Postable address book now. Here’s a simple mini-tutorial on how to find your link & send it to your guests. A few tips before you get started. 1. No email? No problem. Don’t have your guests’ email addresses? No problem. You can send your personal Postable link via text or Facebook messenger. You can also create a Facebook event page with the link in the description and invite anyone you’d like to collect information from. Make the event page private so that only people you specifically choose will see the link and enter their information. Disable the option for guests (in the event page) to invite others. You can even post it to your wall — just keep in mind anyone with access to your page can enter their information. Don’t worry, nobody except for you can ever access the address book itself, so all of the information is safe and sound. 2. Prepare the guest list. Before you click send, one thing to consider. The guest list. Who are you going to invite? If you’re planning on mailing the link out to everyone you and your fiance know before creating your wedding guest list, you may want to think twice. Consoling hurt feelings may be more than you’ll want to deal with right now. Will your old co-workers feel left out if they don’t get a save the date from you even though you asked them for their mailing address? Just a tiny bit of planning out the guest list ahead of time will save you some trouble. It may be wise to send out the link to collect wedding addresses AFTER you’ve created your wedding guest lis. Keep in mind, if you plan on sending a save the date to someone, a wedding invite is a must. If you’re banking on some percentage of people to RSVP with a ‘NO’ — think again. Luck will have it that everyone on your list responds with a cheerful ‘YES’. There’s no need to get yourself into that kind of a pickle. Assume everyone you invite, will be attending. Create your guest list (of people you actually 100% wish would attend) and then mail out your handy Postable link to collect their mailing information. You’ll know that everyone on this list should get both a Save the Date (if you choose to mail these) followed up with Wedding Invites. 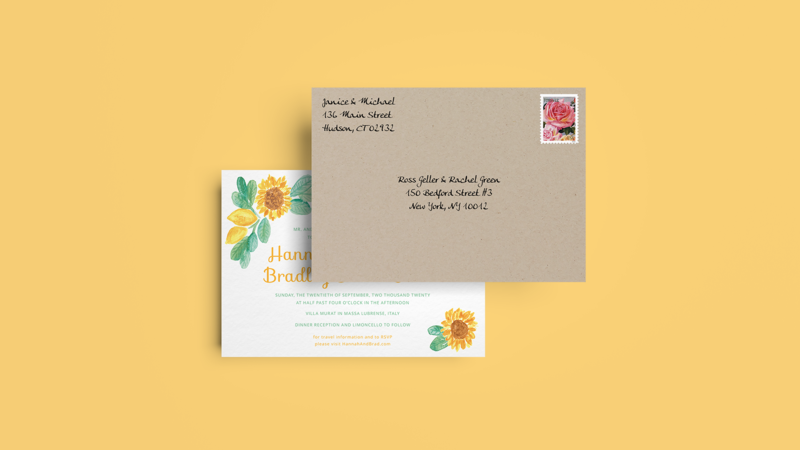 Are you going to want to address your envelopes more formally or will you keep things casual? Do you want to collect some additional information while you’re at it (for example, each person’s birthday)? You can customize your unique address request form to include titles, birthdays along with other information like children names. Make your form your own by customizing the text at the top of the form with a unique description your wedding guests will appreciate. Here’s a simple guide to help you make your address request form on your own terms. Now, you sit back and relax. Watch your handy dandy (free) wedding address book fill up with all of your guests’ mailing addresses. It’s kind of like magic. Only better because this is real life. Once all of the information has been collected and your address book has been filled up, you can easily mail your Save the Dates and Wedding Invites worry free. If you’re like us, and love to make your life easier, you can send all of your wedding mail from your computer (who knew snail mail could be so tech-friendly). Our collection of designer Save the Dates & Wedding Invitations has been brought to you from artists all around the country. You can choose to customize each design with your own information. You probably paid a pretty penny for your engagement photos not to mention how much you love them, why not use them in your Save the Date? Once you choose and customize your design, just select your recipients from your handy new address book and click send. Postable will print, address and mail all of the cards out for you. Now you can rest easy that at least this part of your wedding planning process is taken care of. Wouldn’t it be awesome if the rest was so painless? Hi this sounds incredible, however you have a grammatical error as listed here. “… wedding guest list via email, facebook, or even text message (yup!). Your friends and family can then fill out there own information…” It should be THEIR not there own information.